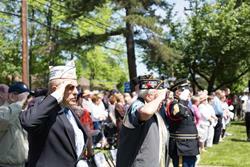 Join Mayor Chuck Cahn and the members of Cherry Hill Township Council at 11 a.m. Monday, May 30, as Cherry Hill honors and remembers the members of our military who have made the ultimate sacrifice in service to the United States. This special Memorial Day ceremony will include a tribute to Cherry Hill residents killed in action since World War II, and recognition of surviving veterans who have passed away in the last year. This year's event will also commemorate the 50th anniversary of the Vietnam War, and the 25th anniversary of the Persian Gulf War, with a special tribute to veterans of those wars who are in attendance planned. The program will include a musical tribute to our Armed Forces by the Cherry Hill Pine Barons Chorus, and the placement of the POW/MIA Chair as a reminder that even though those soldiers are not here, there is still a space for them. Congressman Donald Norcross will speak; Capt. John Scannell of the New Jersey Army National Guard will deliver the keynote address. Veterans and active-duty military are encouraged to attend, and will be recognized during the program. The ceremony is sponsored by the Township in partnership with American Legion Post 372, Jewish War Veterans Furer-Barag-Wolf Post 126, and ShopRite Supermarkets of Cherry Hill. The event is rain or shine, and will be followed by a free barbecue lunch, courtesy of ShopRite. For more information, contact the Cherry Hill Department of Recreation by calling (856) 488-7868, or e-mailing Events@chtownship.com. Vietnam and Gulf War Veterans should call or e-mail the department to RSVP.